I last posted this in 2006. One thing about nice about this tree is that it is still flowering! 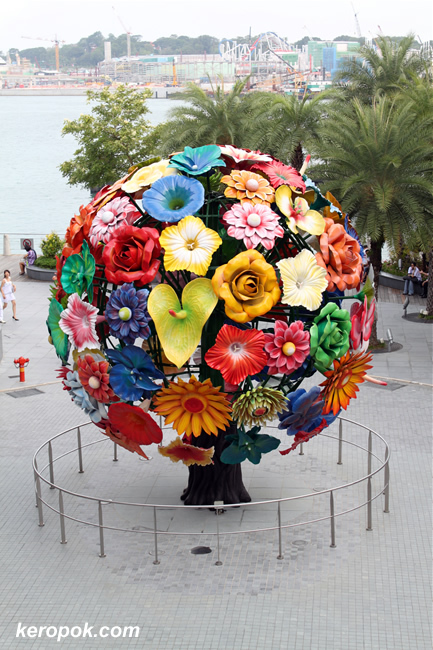 It's called Flower Tree and it's 6 metre talls and it's an artwork by Korean Artist Choi Jeong-Hwa. Very unusual, beautiful sculpture - love it! Wonderful photo! Ya, bright flowers always looks good. but the background is a mess though. Constructions that will go on for quite some time! It really brings out the pale colour of the square! Ha ha... Too bad they installed the railings to protect it.